After transfering from IUPUI in January, senior defender Ben Ogedegbe has already become an important piece of the Colonials' lineup. 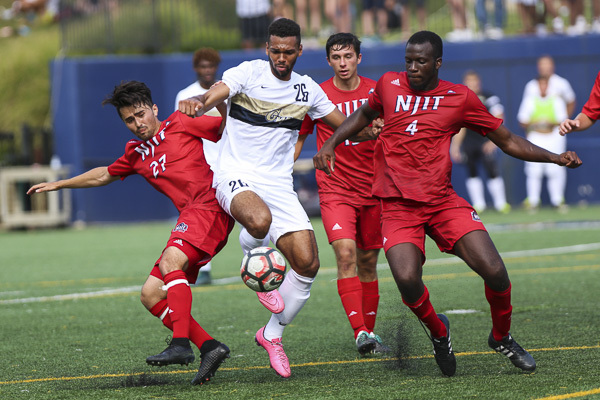 A new figure now stands out in the men’s soccer lineup – towering over other players during the Colonials’ defensive sets, occasionally shouting directions to his teammates. Since transferring to GW for his senior year, center back Ben Ogedegbe has become an invaluable member of the team’s back four by establishing himself as a balancing presence with his controlled style of play, leadership and knowledge. Out of the new members on the 2016 men’s soccer squad, he has had the most experience in his athletic career so far: This past summer Ogedegbe played alongside the under-23 Nigerian national team. He linked up with them during their July trip to Atlanta and participated in practices with the team for the week. Just days after his 21st birthday, Ogedegbe notched 20 minutes of playing time in the team’s first game of the week. After his stint against international competition, Ogedegbe is bringing his experience back to Foggy Bottom. Ogedegbe fights for the ball during the Colonials’ matchup against NJIT on Saturday. He was one of the four field players to play all 110 minutes in the double-overtime tie. Ogedegbe played two seasons at Indiana University–Purdue University Indianapolis where he led the team’s defense and won multiple awards, including a spot on the Summit League All-Academic team. Since coming to GW in January, Ogedegbe has focused on improving his communication on the pitch. He assumed a leadership role that usually belongs to a veteran player on his first day as a team member. “Being a center back is the most vocal position on the field. I have to organize the midfield, the forwards and even my fellow defenders, so as a new player I felt like I needed to step into that role and lead right away,” Ogedegbe said. The Leesberg, Va. native has started all four of the Colonials match-ups so far, playing nearly every minute. Ogedegbe and fellow senior central defender Tobi Adewole have established a partnership in their relatively short time together. The pair bolsters a defensive core that only allowed two goals in their first three games of the season. Adewole provides more offensive aggression, recording a goal and two assists last year, while the more traditional defender Ogedegbe has only produced one collegiate point. Head coach Craig Jones said he’s confident in his center backs’ ability to protect the goal, despite having two new starters in the defensive lineup including freshman outside back Reese Moore. Even with the coach’s confidence, playing time is not something Ogedegbe takes for granted, because less than two years ago, even one minute seemed out of reach. After his first two seasons of collegiate soccer, Ogedegbe tore both of his hip labrums. He was unable to play soccer, kick a ball or even walk during his rehab from the injury. 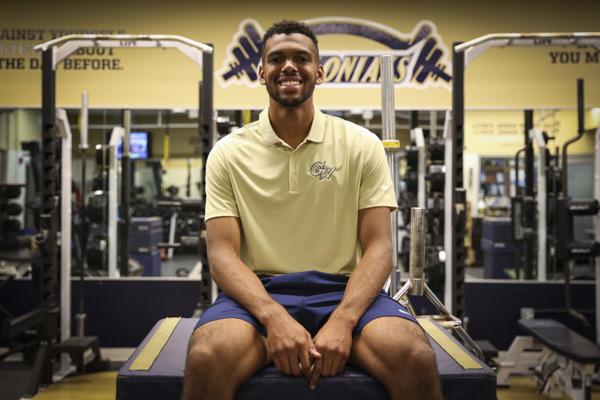 GW’s season-opener against William and Mary was the first official game that he was able to play since his recovery. Putting on his jersey, cleats and shin pads for a real game brought Ogedegbe back to his childhood, he said. In addition to the work he puts in on the field, the biology major has ambitions beyond soccer. Ogedegbe aspires to follow in his uncle’s footsteps and attend medical school after his collegiate athletic career is over. Transferring allowed Ogedegbe to relocate closer to his family and hometown, along with a more comfortable atmosphere and appropriate skill level in the Colonials’ improving soccer program. 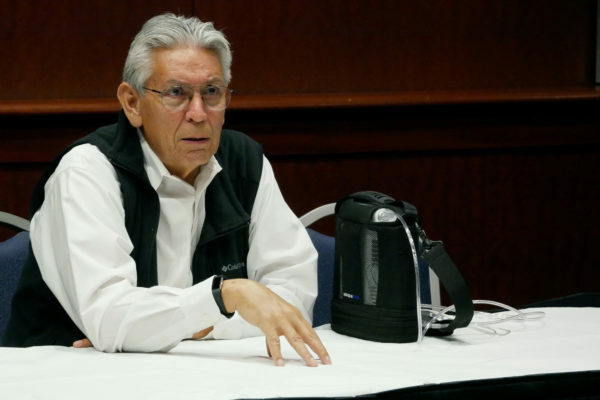 This article appeared in the September 8, 2016 issue of the Hatchet.